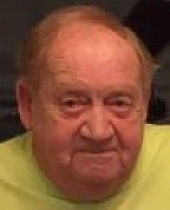 Robert W. Allison, 84, of Ligonier, formerly of Derry, died Tuesday, January 29, 2019 in Select Specialty Hospital, Latrobe. He was born August 19, 1934 in Derry, a son of the late Robert and Stella Shoup Allison. Prior to his retirement he had been employed as a chemist for the former Latrobe Forge and Spring Co. He had served in the U.S. Army and was a member of Ligonier VFW#734 and Byers-Tosh American Legion #267. In addition to his parents he was preceded in death by his wife, Sally Norris Allison, two sisters Roberta Herald and Eileen Wherry, and an adopted son, Richard Craig. He is survived by his daughter, Lorrie (David) Dundas of Derry, two grandchildren, Heather and Craig Dundas, nephews, Robert and James Wherry, a great niece, Patrice Baum, and a great nephew, Christopher Baum. At Mr. Allison's request, all services will be private at the convenience of the family. To send flowers or a remembrance gift to the family of Robert W. Allison, please visit our Tribute Store. "Email Address" would like to share the life celebration of Robert W. Allison. Click on the "link" to go to share a favorite memory or leave a condolence message for the family.